Don’t try to avoid it. While it may seem easier to fire off an automated “Thank you for your interest but we’ve gone in a different direction” e-mail, this makes you seem insensitive and does nothing to help the candidate find success on the job hunt. If at all possible, try to give the individual ten minutes of your time so you can offer tips on ways in which they can improve as an employee, thus boosting their chances of landing a job offer. Are there skills they can sharpen? Programs they need to learn? Things that they can do to present themselves better in an interview? The candidate will find these pointers immensely helpful and will be appreciative that you took the time to share them. 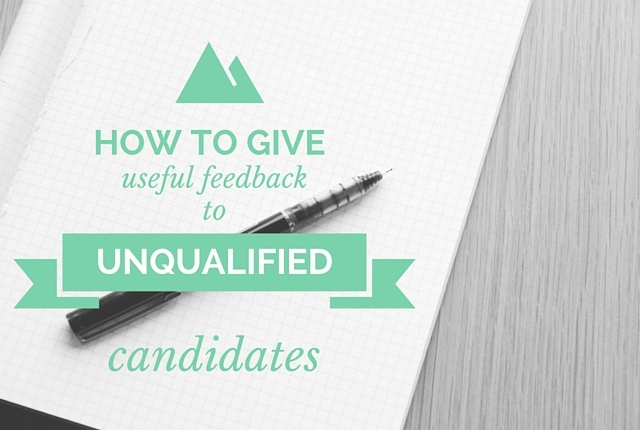 Though you may actually have liked one candidate’s personality more than someone else’s, it’s important to keep the focus on skills and abilities when you’re giving feedback. A person can learn new computer programs, become a better editor, or slow down the pace at which they speak during an interview. They can’t get a better sense of humor. Make sure the feedback you’re giving is actually helpful. Offer some positive thoughts too. While you want to give constructive feedback so that the candidate can improve, you shouldn’t rattle off a list of all of the things that the individual did wrong. This can be disheartening. Make sure to throw in a few compliments about what you found impressive about their resume, or what they did well during their interview. These types of conversations are often unpleasant. Because of this, there’s the natural tendency to stall as you try to sugarcoat the message. This doesn’t benefit anyone. Instead, deliver the information in a way that’s easy to understand. As the conversation is wrapping up, give the candidate time to ask you any questions that they may have. Encourage them to stay in touch about future openings. They may not have been right for that exact position, but may prove to be the perfect person for a job that becomes available down the road. To learn more about attracting qualified job applicants, check out this episode of The Recruiting Reel: How to Attract Qualified Job Applicants — Spark Hire’s video series where we discuss real recruiting challenges with prominent recruiting experts to provide your with actionable tips you can apply to your own recruiting.